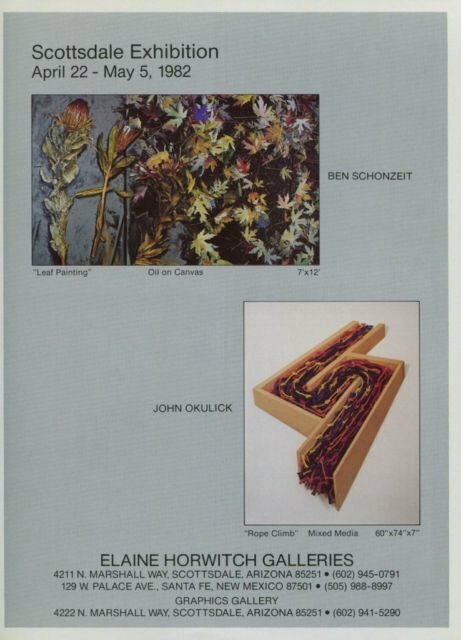 Original magazine advertisement from the year 1982 for exhibitions of works by Ben Schonzeit and by John Okulick to take place April 22 - May 5, 1982 at Elaine Horwitch Galleries, Scottsdale. The advertisement was carefully removed from a magazine. The ad measures approximately 7 5/8 inches wide by 10 1/2 inches high (including margins if any).